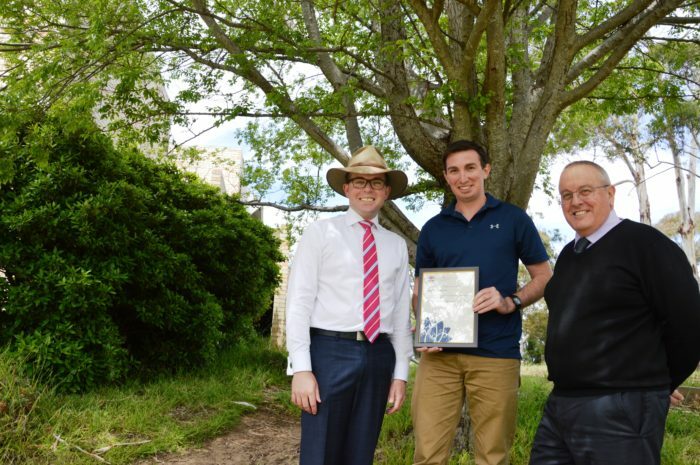 Digging dough – Northern Tablelands MP Adam Marshall,left, Duval High School teacher Mitch Valentine and Principal Stafford Cameron check out the green spaces for a new environmental teaching garden to come via an Eco Schools grant for students with special needs. ARMIDALE’S Duval High School students will create a classroom garden designed to teach them some healthy habits while digging into some elementary lessons on vegetable growing, Northern Tablelands MP Adam Marshall has announced. Mr Marshall delivered news of the government grant during a tour of the new school space this week where students with special needs will get a new sensory outdoor classroom place. The school has won one of 80 grants across NSW awarded for special environmental projects, worth $3,500. Mr Marshall said the funds would enable the school to turn a 40-square metre space into a sensory garden to educate the kids in healthy habits eating through growing their own vegies and salad plants. Duval High School teacher Mitch Valentine said seven students from the special needs class would be the chief gardeners but the area would be open to all students. A small outdoors area off an old science laboratory classroom will be terraced and planted to provide another space for learning, not just about how to grow and maintain a sustainable garden but also how it can act as a place for emotional retreat and reflection. “It’s a great concept they’ve come up with for students who might become their own primary carers in a few years,” Mr Marshall said. The students will be involved in organising and preparing the garden, from planning of the retaining wall and terraces, to the installation of corrugated iron beds and planter boxes and greenhouses to the planting of seedlings. “The students will get a hands-on experience in growing plants, in developing healthy eating habits and in actually preparing food in the kitchen for eating,” Mr Marshall said. The students have already got a head start on the gardening – they’ve begun clearing the space and are about to sow beans, carrots and strawberries as the first crop in their new study schedule. The funding comes through the NSW Environmental Trust’s Eco Schools grants program.